At just a centimeter high, this pendant isn't big in size, but it packs a big stylistic punch as it communicates your affection with both sophistication and a good deal of sparkle. 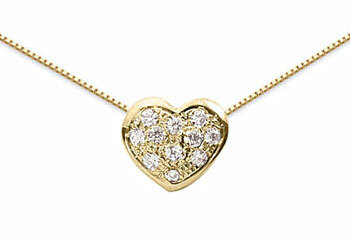 A total of 11 diamonds fill this petite heart pendant, glimmering within a shining frame of 14K yellow gold. Nearly a quarter carat of stones allow this piece to serve as a small but sophisticated symbol of your love as it hangs elegantly from an 18" box chain. We guarantee our 0.22 Pave Diamond Heart Pendant, 14K Yellow Gold to be high quality, authentic jewelry, as described above.